Field days seem to whoosh by in a seamless tirade of bodily abuse that starts in the balls of the feet, grows through your hands and wind blown cheeks before reminding you that you are starving hungry and you’ve only just taken over the driving seat. A very dissapointed 1012s QSO this year and we still can’t work out why we lost ground so fast with the other leading stations, even on 80m where we should have held our own. Certainly having a tribander at only 35 feet is a hell of a penalty to have to suffer every year, but why our 40m and 80m runs were not producing the numbers that the other high-flying entrants were managing? I just don’t know. High probably does mean might. Last year’s 1,000 foot entry was very different on the higher bands to this year. Mostly, we were firing right through a heavy forest. I wonder how much attenuation there is in 500 yards of dense oak trees that are about 80 feet tall? Well, you get my drift. Filtering this year was amazing. We used a second rig as a dedicated 2nd receiver using James’s new Band Pass Filters, made to Bob Henderson’s designs and we had negligable breakthrough. I can’t wait to use the new permanent multi-two station when we have the stub filters in place too. Anyway, although I’m gutted that we probably didn’t even make the top three, we still had a good time and achieved some learnings too. Contesting for me is about three things, learning, competing or having fun. Ideally, all those things. This year I had all of them but not at the same time. Knowing that we were beaten within 2 hours of the kick off made me push extremely hard, but we just couldn’t catch the leaders. Grrr. Oh well, next year we’ll be back, stronger, cleverer and with a better strategy. My thanks to Lee (G0MTN) James (M3YOM) Terry (G4MKP) and Aidan (M6TTT, Scout) for getting our new station on the air for a first-time-out on WPX. We also roped in Chris and Dan, two new foundation student contest Scouts for the spotting on the Mult Station. Barry M0DGQ also gets a big thank you for supplying hundreds of meters of 75 ohm coax for James’s stub-filter project and Charles at Moonraker for sponsoring the large number of required PL259 and T pieces. We ran a pair of very old Yaesu FT1000MPs (non-Inrad versions) which were completely swamped by QRM to a number of interesting antennas including our new super all-band Mega-Loop (horizontal delta loop at 85 feet) delivering about 12dbi on 20m to US at 10 degrees elevation (more on higher bands). However, it also delivers 10dbi to EU and most of Russia at a very low angle, hence QRM flooding. James’s stub filter project worked but still needs some tweaking. Thanks to K1TTT for helping James get his head around this. Next time, James will have finished Bob Henderson’s filters as well which should sort out any final interference between bands. Poor James soldered nearly 100 PL259s last week. 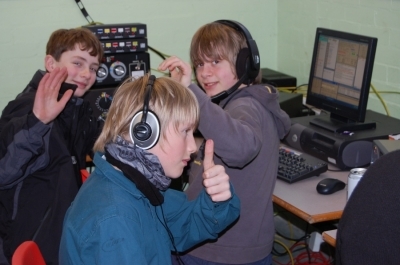 Don’t worry James, fingers should re-grow by CQWW! The mult station ran Terry’s A3S at 30 feet on my hydraulic tower and also switched in a 200 foot doublet at 80 feet across the tree canopy behind the Scout Hut for the low bands (which worked great on 40m DX but rubbish for 40m NVIS). Need some switchable low dipoles for EU. We had an initial target of 2,500 QSOs and 1,000 mults and just missed both by a whisker. We had two breaks of 30 minutes each to sit and have dinner / lunch as a team, an important lesson to keep morale and spirits high. Some day we might not be able to afford time off, however whilst we’re still novices and part-time, we can afford to have a lazy lounge around. We sent our score to GETSCORES every 5 minutes automatically fed by N1MM on a local wireless LAN picked up from my house about a 900 meters away. S51A and ourselves played ping-pong on the scoreboard for the whole 48 hours and we’ve since become competitive friends. We particularly liked GETSCORES since it’s a way of interfacing with the rest of the world and having even more fun. I don’t understand why more stations don’t use this system. The USA seem to embrace this stuff quicker than others. There were many highlights. Working VK on short path AND long path on both days on 40m was a privilage. Many more experienced contesters might have done this before but at last a first for me. Having the young non-licensed Scouts successfully finding some RED mults on N1MM was cool. Being called in just to work them was even cooler! Handing the headset over and telling them, “Great. Find some more!” was even better than cool! James’s run into South America was nice on 15m on Sunday, as was the long run on 20m band. Being spotted three times in 5 minutes from the West then the East then the West again was like using a very high gain vertical (which was the bloody trouble actually since we couldn’t dial out the QR Mary). Like all (good?) 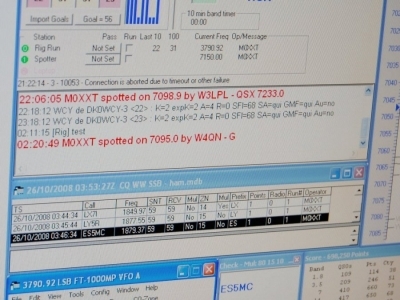 contest teams, we’re now working on massive improvements since the station only came together on the Thursday and we started transmitting essentially 90 minutes before the off. Everything worked, nothing broke. Amazing. 107 in the log. I’ve no idea what my score was since I used N1MM’s DX Serial Contest template to do the logging and the miscellaneous field for logging random text did a hopeless job of being able to edit long club names efficiently. The last time I entered this contest, my log was called into question when the adjudicator asked me to clarify what I meant by the club station “Reading”. It transpired that there was only one radio club in Reading anyway. I vowed not to do this again but I’m back. This year, I had the added luck of G3WZT CQing 1.7kHz up from my run frequency of 1.903 MHz on the off at 8:00pm. Yes, I had been talking to James for about an hour prior to the off and yes, of course he would have noticed me there - but his deep concern for our predicament was (to use his words) ”tough luck”. John, thanks a lot, 1967 RAE passes were obviously excellent vintages. I’ll endeavour to remember you next time and offer you my run frequency quicker than you can say, “I’m a G3 and I certainly act like one”. I wonder if you behaved like that in 1967 when you had a fresh RAE pass in your pocket and a 12wpm ticket? Luckily for me, the scout hut was warmish during the event so I wasn’t doing my normal teeth chattering. I took a 20 minute phone at 10:00pm from Wendy which gave me a break but I missed a few because of it and then S&P’d for a while. I notice that there were actually very few clubs playing which was strange. I would have thought this would be more popular. EI and DL stations were playing too, giving Non Member reports bar one DL who gave his full radio club, bless. I wrote Non Member in my log but didn’t tell him so not to cause any upset! Absolutely nothing wrong with the antenna; 174 metre equilateral triangle at 85 feet fed with 4:1 balun and coax in one corner. It had good ears. Only three stations I gave up with and two of them were in mainland EU; a PA and a DL. M3s (and M6s) were heard well on their 10w. I notice last year’s top score made 130 Qs which was a reasonable benchmark so I’m fairly pleased with 107 bearing in mind the proximity to “John the G3″ and that I had to take Wendy’s important call at 10:00pm. I could only make more if I was either slightly more lucky with the G3s – or played more seriously with SO2V. Will I do this contest again? Well, I’m not used to a) the quality of operating (come on, it was a bit geriatric) and b) I’m not that keen on the rules. Even just logging the Town would do justice to copying something interesting and different, but logging ”Wensleydale Cheesmakers Transmitting and Electronics Amateur Radio Society” is a bit of a mouthfull. In light of the fact that this contest is apparently a route to getting newbies interested in contesting, forget it. Committee, do yourself a favour and get into my head. I have M3s that want to operate. Give them something they can do and build their copying (and confidence) skills, not drown them with difficult reports under heavy QRM. Anyway, Sunday’s Remembrance Parade was fabulous. I was back to Front Rank Drummer again after all these years. Great! Arriving at the site on Lunchtime Friday, I got the tent up in a complete hurricane. Stripped to my shorts and a T-shirt in the driving wind and rain and all on my own, at one point I just burst out laughing at my predicament. The only thing that kept me sane was the knowledge that some other crazy people in other parts of Europe were also following my example and getting their stations worked up. Finally at about 15:30hrs, I had a tent up - and all the tent pegs used up, a sure sign that I had screwed the thing hard into the ground. Sporadic rain continued as Terry and James arrived to part assemble the A3S. 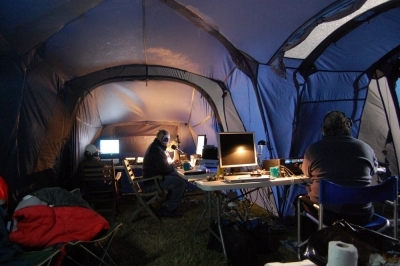 Eventually, James and I were left to our own devices to continue building the working station in the tent, networking the machines and arranging the PCs etc. Still, no antennas had been erected. After our meal in the evening, a quieter weather front descended on us and with still an hour of light left, we put up the 60 foot mast that would house the 40m and 80m fan dipoles. We kept pushing and pushing, even firing up the lighting rig to give us 10kW of light to finish the job (at 1:00am in the morning!). Both dipoles tuned fine, fed off a single 1:1 balun at the top with Westflex straight to the tent. Only the A3S to mount in the morning. Indeed, with Terry and Lee’s help, we had the A3S up at about 10 meters by mid-morning and we ran a few numbers whilst checking N1MM’s implimentation of Reg1 Field Day. Unfortunately, I missed a trick and for the whole contest, we ran without automatic multiplier recognition. Scoring was right, mults weren’t. What do we all tell everyone to check? The software. What didn’t I do? Grrr! Plonker! With a couple of spare hours left, I erected the RX loop on a spare mast on a Barenco wheel clamp, running some RG58 back to the tent. Big mistake since the coax “leaked” too much which meant that some bands were difficult to spot due to proximity to the TX antennas - even running Barry’s new Stub Filter switch that he had made for us - but we’d just ran out of decent stuff. The next 24 hours was a blurr of operating, cups of tea and running repairs. The only real thing that let us down was the 1:1 balun driving the fan dipoles on 40 and 80 which seemed to go open circuit. At 7:30pm on Saturday evening, we dropped the mast, stripped out the balun and directly connected the coax via a spare dipole centre. This meant that Terry carried on running on 20m for longer than he wanted but the propagation came back and he ran a string of West Coast stations prior to dropping down to 80m. Maybe a blessing in disguise? Lee’s Saturday afternoon stint was taken over by Terry and both left the site by dinner time to leave James and I to run the night shift. Doing half-hour on and half-hour off, we managed very well. It was one of the most interesting night shifts I’ve done. I think staying fresh with only 30 minute stints may have helped. On the other hand, sometimes I wanted more time on the mic, but as a compromise 30 minutes seems about right. Big contests aren’t right without the obligotary ZLs and VKs early on 40 meters and we were pleased with a small crop of these. Fresh as a daisy, Tim and Terry arrived back on site within half an hour of each other at around 6:30am to allow James and I to hit the sack for three hours sleep, rising just before coffee time in the morning. I hate the last couple of hours of the /P contests. I know it all has to come down and everything needs packed away again so to get ahead, I dropped the RX loop and packed away the second receiver station, neatly arranging everything in the tent door before lunch. Blur descended on us. Looking back, everything is in speed-up mode. All I can remember is getting in the bath at about 5:00pm on Sunday night knowing that the car was still jammed with gear. Enjoy the photos - and write back if you like my drivel! 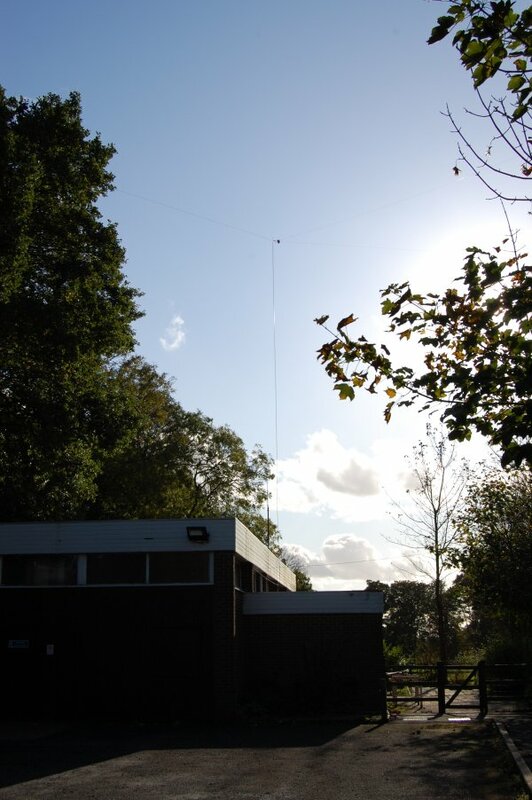 This year, James and I ran M0XXT at the Scout Hut using a pair of XXT Mega Loops; a full size 160m version and a half-sized one which suited the top end of 80m and 10m. Full-sized Mega Loops don’t work on 10m. I ran out of time to put up a TX vertical for top band, even though I did finally finish making it ready for tuning by Saturday morning during my “off” times at night. Another job for next year. 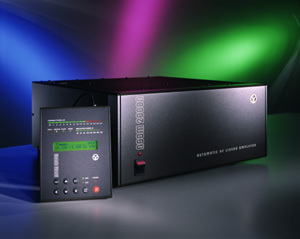 RF was via one of our FT1000MP radios and amplified by an ACOM. A pair of Dell PCs running N1MM did the logging. We networked the PCs for disaster recovery purposes and used the second copy of N1MM on the spare PC a couple of times when RF shut down the run machine. We were Multi-Single. The antennas really worked miracles, showing almost unbelievable gain which in the main distil to 6 equally spaced compass fingers or lobes - with the main RF being squirted at around 290 degrees (since it’s slightly twisted off it’s X axis due to the perfect location of the local oak trees for USA propagation). I won’t bore you with the compass bearings, it is suffice to say that these RF fingers cover most high density population areas of the globe. The whole topic of these XXT Mega Loops needs a chapter to themselves and as I write this on Monday evening, I can report that this afternoon I ran a huge pile-up to the west coast US at about 16:00z, at one point switching the amplifier off and continuing to run the pile up with 10 watts (!) which reduced our average incoming signal report to 5 and 7 from 20dB over S9. Even on 40m, the gain figures are healthy with 5dB at 10 degree take off angles to the US. 80m is just a big bubble of RF but with the antenna at 90 feet elevation, at least the bubble has some flatness to it. Same with 160m - hence the idea of a massive vertical. No real technical surprises this year. Everything worked out first time, only after updating SCP did I realise that M0XXT wasn’t shown in the database! What a numbskull. I meant to drop Randy a line to ask for this new call to be added. Having our call queried heavily was quite normal and tedious. Strategically, we didn’t really have a plan. We believed we would conquer the world and be louder than anyone else(!). We’d just shout louder :) Of course it doesn’t work like this and after my 6th CQWW, I can genuinely say that I was yet again blown away by the strong signals on 40m. I even reminded James that this would happen, but it was worse. Isn’t it always like that? This damned loop might be great on TX but you can’t dial out the QRM! 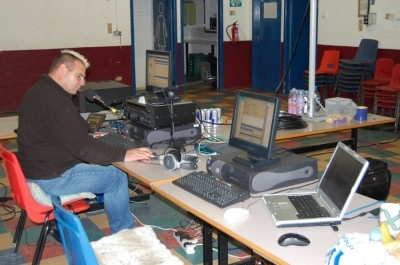 I feel some receiving antennas coming on..
As a team, we had some fabulous times scoring 97 countries on 20m and 92 on 40m. We wanted DXCC on both bands but it wasn’t to be. Had we known that 10m was going to close on Sunday, we’d have spent more time increasing our multiplier-score on that band during Saturday. Experience counts and we lack quite a bit sometimes. I personally had a couple of exceptional highlights that I’ll remember for a while. The first was on Saturday evening, running a split to the US on 40m and getting a pile up for my money. The rate meter peaked at 230 which I thought was pretty darned good. At one point, I burst out laughing with a mixture of adrenaline rush and terror! I have never had a high-gain antenna to the US and just didn’t think that it was possible to have so many people calling you! Getting spotted by W3LPL made it worse (or better..!!). The second was during the last half-hour of the contest. We happened to find a tiny gap at the bottom of 80m. I was happy just to score a dozen stations and wrap the deal up. Instead I had another pile-up after being spotted by an EI station. When I remembered to look, the rate meter was at 199 whilst I worked 60 of the bigger ticket Dubyas side-by-side DK and PAs inside 30 minutes. Showing off? You bet! Just fantastic. Most of the time, we doubled up on the headphones with the spare man checking email and stuff, on standby for some nasty QRM busting ears. N1MM has the CTRL E feature for shooting messages to each other. We used this to fire callsigns at the runner to help them out. Well, I happened to hear an Italian station call us and he used our callsign so we didn’t confuse his call to us for someone else. His pronunciation of “Xray Xray” can only be described as “eggs-ray eggs-ray”. I thought this was quite funny and shot it over to James using the CTRL-E feature. What happened next is one of those moments where everyone gets the giggles. I had to run out the room and laugh out loud in the park (in the middle of the night. No wonder the locals stay away from me!!). The precise scoring is on a memory stick so I’ll have to report that another time, however we made just under 1.5 million points - and although the station was running for 48 hours, we had plenty of downtime and research moments. James and I can be accidental science professors and it’s unfortunate when a great idea for a piece of software or a new antenna pops up. Everything has to stop while we consider it. Of course in the middle of a decent run this is impossible but band changes can slow the rates down to a dribble. The mind wanders and before you know it, we’re demonstrating a new system of antenna erection or a complete re-write of N1MM. What a hobby! As I was drifting off to sleep last night (like a breeze block! ), I remembered a load of lessons learned topics to write down. Now I can’t remember them. My top tips therefore rely on my favorite topic; having fun. It’s just a game. Collectively, we have extremely limited experience with VHF. It came as quite a shock to the system to score so few QSOs relative to HF contests that we enter; we are used to scoring 1,500 contacts in a weekend. I must say that the turn-out felt positively low. Is this really the state of VHF contesting in the UK..? Our location couldn’t get better for a Midland club; 1,000 feet high with easy access on private land (IO91bx [edited, did say IO92bx..!]). The weather was a different story with both the consistent rain and very high winds contributing to some scary moments. Why all three antennas were still standing on Sunday morning, I can’t understand however the guys, stakes or poles didn’t move an inch. Perhaps a testimony to all my recent knot learnings at the Scout Hut! 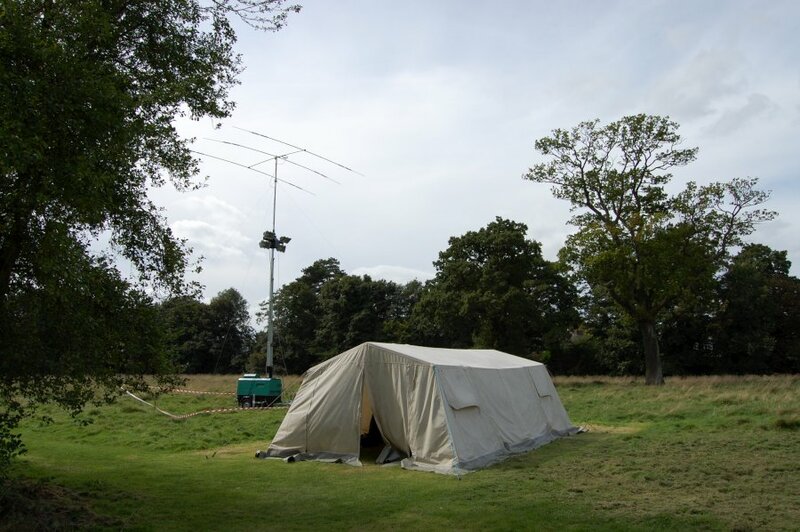 With limited resources on VHF, most of the gear had to be procured recently to enter this event including a 17 element Tonna and a three element Moonraker beam for 6m. A couple of months ago, we bought a strange X-Quad affair for 70cms which after completely stripping down and rebuilding last week, appeared to work well but we have no way of comparing it to anything else. [Edit: since found out this is a Jaybeam Multibeam, 48 element 12dbd ATV type antenna circa 30 years old]. At 2m long with zillions of elements, I trust it’s as least as good as the Tonna is on 2m. Time will tell. Again, we had to get equipped with rotators so we bought a TV style rotator for 6m and acquired a Hirschman rotator when we bought the 70cms antenna. The Yaesu G450 is permanently attached to the hydraulic tower for the 2m station (normally running an A3S). Coax was also a stumbling block, particularly for 70cms where we only had 50 watts available to us and potentially lots of loss on our standard cut of Westflex, perhaps too lossy for 70cms? A 30m length of Ecoflex 15 was despatched from Diode with matching connectors last week to compensate. The line-up ended up with FT-2000 on 6m at 100w with a 50m run of Westflex to a 3 element beam at 10m. For 2m, we ran TS-2000 on 100w via 30m of Westflex to the 17 element Tonna at 10m and a pre-amp at the rig end. For 70cms, we ran a further TS-2000 which is factory throttled to 50w through 30m of Ecoflex 15 to our weird X-Quad type antenna at only 9m. Perhaps a small linear for 70cms next year and a pre-amp? A bigger 6m beam will be discussed for next year too. Logging was exclusively N1MM on Dell Optiplex machines and 15 inch flat-screen monitors without networking enabled due to running separate serial numbers for each band. One Optiplex blew up on Sunday morning after refusing to boot due to condensation we think. We had shut the station at 2:00am for 4 hours to get some sleep and upon waking up and restarting the generator, James discovered an issue of the PSU. Hilarious at the time because when it was plugged in, it sounded like a crunchy plastic pop bottled being scrunched up and I’m shouting at Tim to take the plug out. But like the boy who always cried “wolf”, Tim’s got wise to my practical jokes and really thought I was scrunching up a plastic pop bottle and refused to cooperate. A final “bang” from the PSU convinced him that perhaps this time, I really was telling the truth! Very funny. Before the off, Tim’s testing proved useful on 6m scoring a number of interesting DX entities, including 7X2RF from Algeria - which enlightened some passers-by who were amazed at what we were doing. I nearly sold two more Foundation tickets! At 15:00hrs local time we started in anger with myself on 70cms, Terry on 2m and Tim on 6m. Having James and Aidan as rotation operators meant that 70cms didn’t become too onerous (50 QSOs in 24 hours..? Ugh!). Massive thanks to Aidan from the team here; he attracted at least 50% of our score on that band, refusing to give up and logging each contact in a determined and professional manner. This was Aidan’s first time on a contest and he’s just 12 years old. 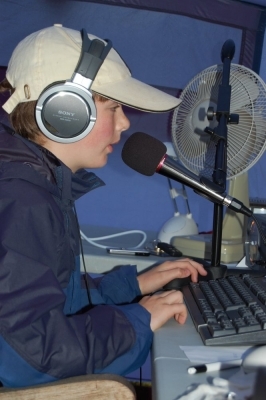 May I take this opportunity to thank those stations that recognised Aidan’s youthful voice and his achievement on this band, you stuck with him to ensure a 100% completion for each QSO. Aidan is currently under guidance as part of his foundation license and to be schooled in contesting so early, we think was marvellous. Thanks to all who helped him. Let’s be clear that he had guidance for each QSO and not left to his own devices. As a “restricted” entry, we couldn’t use brute force to open any doors and it therefore is a slight embarrassment to only have logged 156 QSOs on 2m, 48 QSOs on 70cms and circa 95 QSOs on 6m. The “magic” band did prove to house some interesting DX from North Africa through to the deep Mediterranean but 2m and 70cms held back offering us no more than 600 km contacts and then very infrequently. 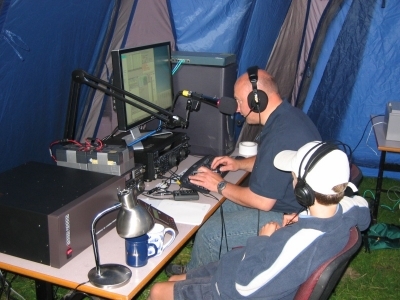 Most QSOs were inside the UK although 21 large squares were worked in the end from Ireland through to Germany. The weather attempted to dampen our spirits but with such strong characters in the tent, we made our own fun and had a ball all the same. At dinner time, we turned the volume down on all three sets and sat down together for our evening meal. I had cooked a top-line Spag-Boll and Terry had us wash it down with a few bottles of bubbly. Fabulous atmosphere. We were amazed at some of bad signal quality issues being produced on mostly 2m and 70cms; warbley modulation and severe splatter in the main. In one case, we had a couple of polite conversations over a period of a few hours regarding a particular club’s 60Khz splatter until they finally believed us and turned down the wick. I realise that Open class stations might adopt the AKR attitude, “All Knobs to the Right” but for the rest of us, even stations 60 miles away can still be 30db over S9 and this can spoil the fun when the signal isn’t as clean as it should be. Please check your equipment before the contest. No real issues materialised bar some water in the 70cms feedpoint which was fixed by a wild guess. Dropping the mast and pouring it out and resealing it for another day had us back to full power. The PSU which blew up the 70cms Optiplex didn’t hurt too bad but dropped the 2m station for 10 minutes while James and I recovered the data by swapping out hard drives - just as Terry finally scored a small run into Northern France! The new tent, “Battalion HQ”, held up well to the weather, only developing a couple of extremely minor leaks after continual battering rain for 24 hours. With its huge side-pods, it really became a massive area to work in allowing a full kitchen in one area and an operations room in the other with a dining room for 6 people. We’ll roll this out again for SSB Field Day. Trust you’ll be there? There is some mild debate in the team if we’ll do this one again. 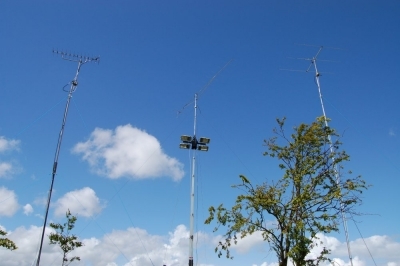 I’m told that VHF can be fun with some lifts into the continent but maybe Silverstone, Wimbledon and perhaps the rain damped that down – as did lift conditions I think. I’m amazed that with all those FT847s and TS2000s sold, few operators perhaps even knew to turn on their radios for an hour and work a few of us /P stations on 6m, 2m and 70cms. However, we did work a few vertically polarised stations quite easily who were giving away single digit points and I thank those stations for coming on since we worked hard for every QSO. It’s really quite easy to score a few QSOs from home with a V2000 style tri-bander vertical. Someone, somewhere should fly the flag for this since hundreds of private stations could have helped make this a bigger event. SSB Field Day 2007 with M0XXT/P and our new amp! This was our first time out with our shiny new callsign with Chris (G1VDP), Tim (M3SDE), Lee (G0MTN) as well as myself as the main ops able assisted by Marti (M1DCV) and our 12 year old scout helper, Aidan - who ran the spotter station for the first time in his life - thanks Aidan. Colin (M3OFW) popped in a couple of times and took great interest in the setup - welcome to Colin. For antennas, we went to town on qtr waves as well as dipoles for 80m and 40m but we let ourselves down by the tribander which we couldn’t get to work properly - showing fluctuating SWR, particularly on 20m where we could really only effectively run lower power. We found out afterwards that only one strand of copper was being used as the main feeder at the connection point to the driven element. Clearly a serious blow and we should have made many more Qs on 20m. This is a new callsign / club with a new direction and a number of people need to be thanked for riding this wave with me, particularly all those mentioned above: Tim, Chris, Lee and Barry - and of course young Aidan and all those other young scouts that we hope to introduce to contesting over the years.